Kamen Rider Build - A New Rider Or An Ultimate Form For Kamen Rider Cross-Z? A scanned image for the upcoming 5th wave of new Remix Rider figures has surfaced featuring Builds upcoming power-up forms RabbitRabbit and TankTank plus a silhouette of a still unrevealed figure. Could this be a new Rider for the series? Or is this a power form for Blood Stalk or, is this going to be an ultimate form for Kamen Rider Cross -Z (as we all know that secondary Riders are all getting ultimate forms lately) that we are all wishing for him? Only time will tell. Did you guys forget about the Hazard Trigger? This form is RabbitTank Hazard. I think this is a final form 4 Cross Z due to the fact that the two horns at the middle of the helmet looks very reminiscent to the horns he has in his default form and also the shape of the eyes is identical to the other side just like is default form as well. I think you should say since Agito, G3 has G3X system and Gills became Exceed Gills..
That silhouette too similiar with Cross Z default form.. Maybe it's just repaint form or Cross Z Hazard (with total black body)? 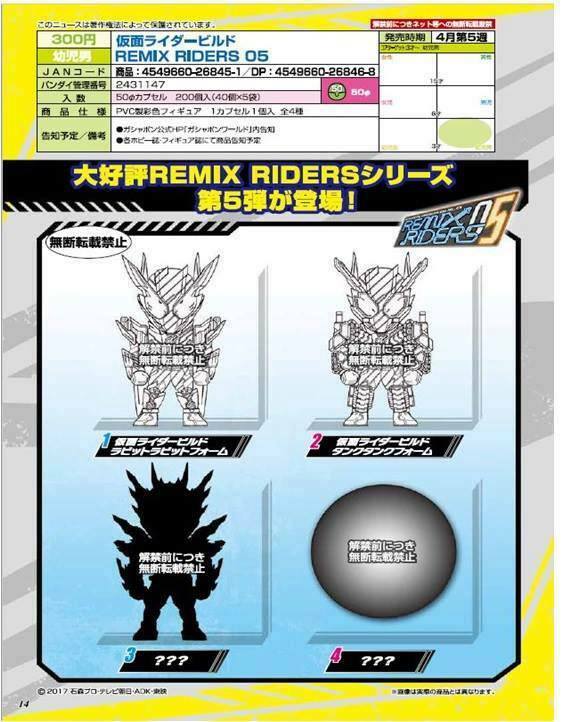 Keep in mind that 3 of the figures are based on forms or riders who debut at the previous month.That makes me wanna believe that the shadowed figure is going to be a kitbash form for Cross-Z and it is going to be a one time form or a new unplanned upgrade based on the character's popularity. I wonder how is this going to work for Cross-Z?Cross-Z Dragon doesn't have additional sounds,and the hazard trigger probably only functions with best matches and the fullfull bottle.